I recently stopped into the new Whole Foods in Colonie Center. We were shopping at Target across the street, and I wanted fresh juice. 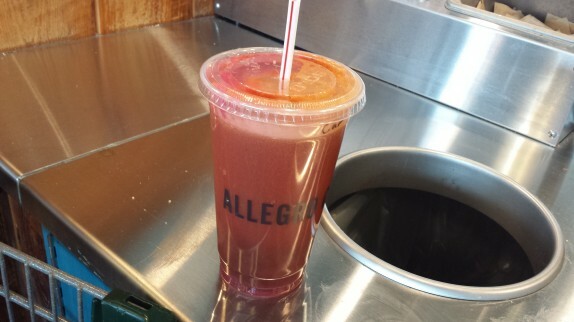 So I figured their fresh juice bar was a better option than a $7 bottle of bottled stuff from Target. 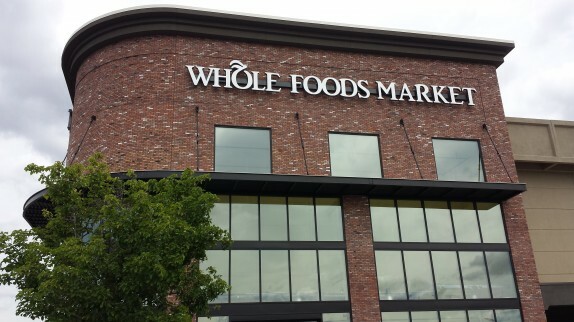 I’m pretty lukewarm on the whole idea of Whole Foods. It’s a grocery store, and I’ve gotten pretty good at maximizing the other markets for price and weekly staples. I’m not Whole Foods’s target audience for one-stop-shopping, and that’s fine. But I always like to see what new markets have to offer. As I walked in, I saw three huge Pabst Blue Ribbon displays surrounding the entrance, driving home the point that I’m not their target audience. As soon as I stepped into the store, an overwhelming waft of seafood hit me. Looking straight ahead, there was a seafood counter, but there was an entire produce section between me and the seafood counter. Walking through the produce counter, the odor became worse, so I didn’t really care to scrutinize the produce offerings. Looking through the rest of the store, it was just about what I had expected for the market. Some of the prices seemed high (not unexpectedly), some seemed competitive. The fresh meat counter looked like it had some decent cuts, but it was just a little too close to that stinky fish counter for me to even think about buying anything. The refrigerated case with the chicken breasts was far enough away, so I grabbed some of those. They are some of the most flavorful chicken breasts I’ve ever eaten. I’ve been simply grilling them with a touch of salt and pepper for my salads. 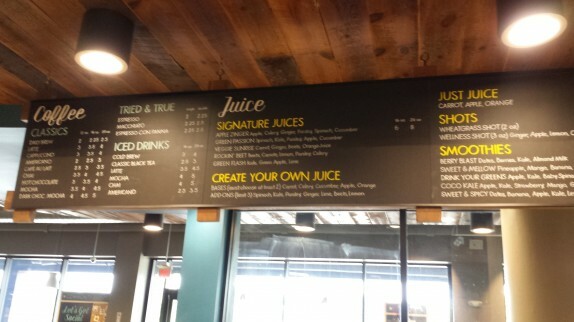 I made my way to the juice and coffee bar and looked over the options. The juices may seem expensive at $6 for 16 oz and $8 for 24 oz, but that’s pretty reasonably priced considering the fruits and vegetables are organic. I really wanted beet juice that day, so I created my own with carrot and apple as the bases, and kale, ginger, and beets as the add-ons. I went for the smaller size just because this was a snack. If I would have bought the ingredients to make this juice at home, it would have costed me about 4 or 5 bucks, and I would have had to buy more than enough to make one, so I didn’t mind spending the extra couple of bucks for overhead. There were about 5 coffee and juice orders ahead of me, so they told me there was going to be a bit of a wait. That was fine with me because there were a bunch of Bake For You cookies in the case behind me, and there was also a pastry counter. 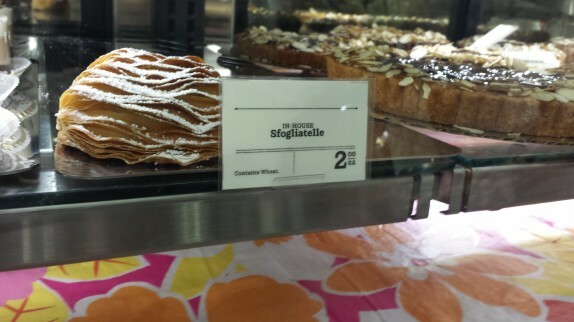 They had house made sfogliatelli for a very reasonable price. The baked goods made on premise are mixed in the display, so you have to read carefully to know where stuff comes from, but it all looked pretty good that day. 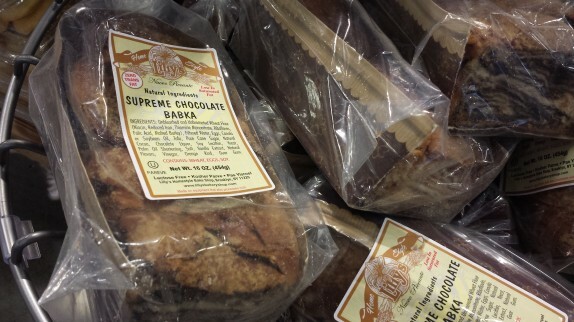 They had a bunch of different kinds of breads, including chocolate babka, which, if you’re a Seinfeld fan, you’ll know as the better babka. There was a whole food court that was a little too busy for me to stroll through. In the middle of the food court, I found some of this “Crazy Squirrel Sriracha” with is manufactured exclusively for Whole Foods, and it is not your average sriracha. It packs much more of a punch and isn’t particularly loaded with sugar, so it’s right up my alley. It’s addictively good! After all of these antics, my juice was ready, and it was time to mosey on down the road. Boy, that fish odor can turn off a lot of sensors…it’s such a chore to display fresh fish and especially answer questions about how fresh it is from the customers. I see to have a snack food route in San Diego and my last stop on a Friday afternoon was a seafood market and they’d cut you up 3 big halibut steaks, right out of the water, or fresh mahi mahi and take it right home and grill it. Delicious! 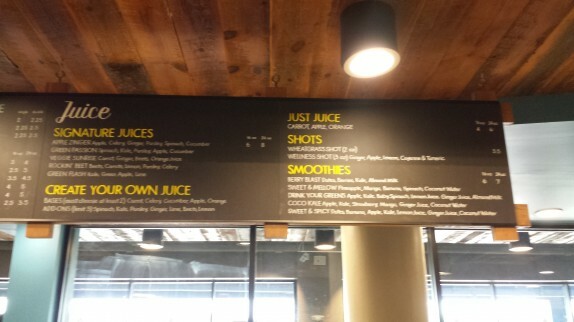 Just over the past week the pricing on juice and smoothies has gone down which is kind of nice. I got a 16 oz coco kale smoothie for $4.37 last week.